I thought I needed a dose of oily fish and omega 3 and unfortunately the only thing kicking around in my cupboards was sardines. I’m not their biggest fan so made a big pot of spicy, tangy, juicy puttanesca sauce to hide them in! Heat up some oil in a big pan, add the onions and cook gently until soft. Add a squidge of tomato paste along with the garlic and chilli and cook for about 5 more minutes. Pop in the can of tomatoes then fill half of the empty can with hot water, rinsing it out then emptying it out into the pan. This adds a little more moisture to cook with. Bring to the boil, add the bay leaves, a sprinkle of salt, pepper and sugar and a cheeky squidge of tomato ketchup to sweeten up the bitterness of the chopped tomatoes. Simmer for 30 minutes or so until reduced down. 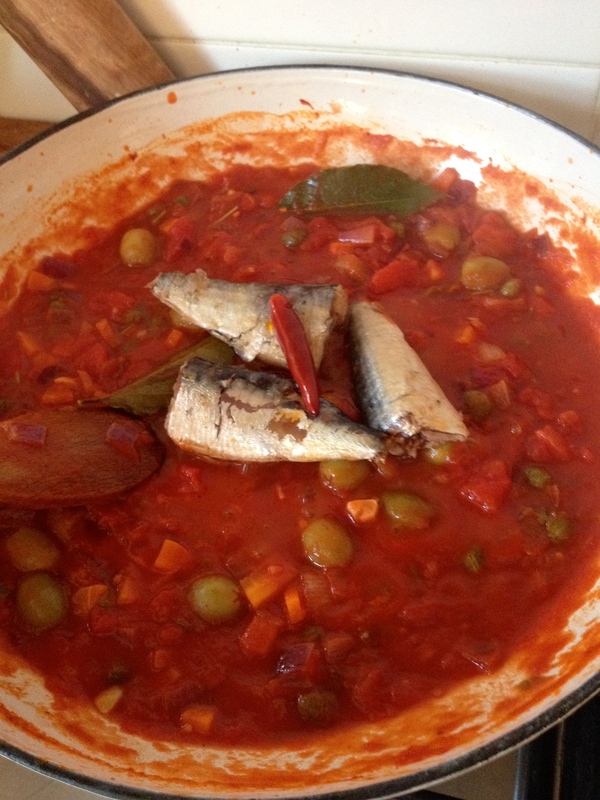 Add in the capers and olives half way through and pop the sardines on top to heat through. 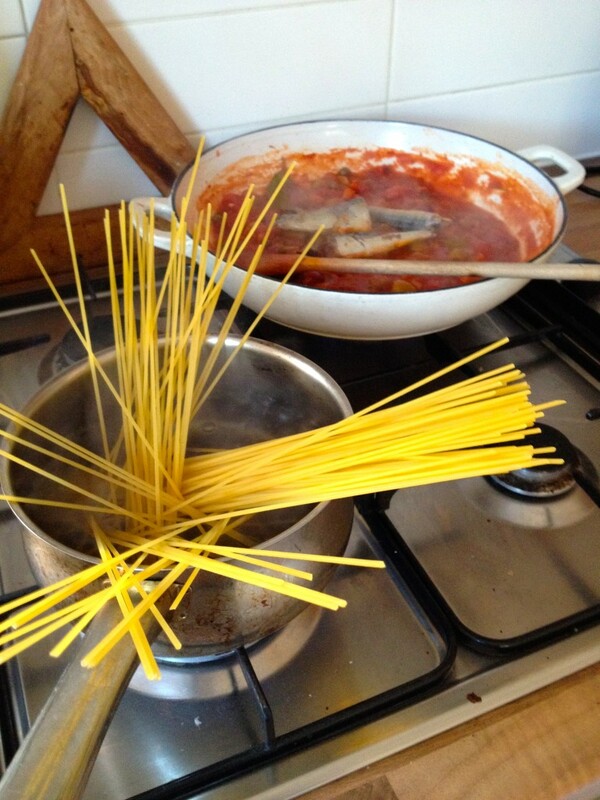 Cook the spaghetti in boiling salted water, keeping a bit of bite to it. Spoon everything into big bowls, add a grind of black pepper and, of course, a huge handful of parsley. 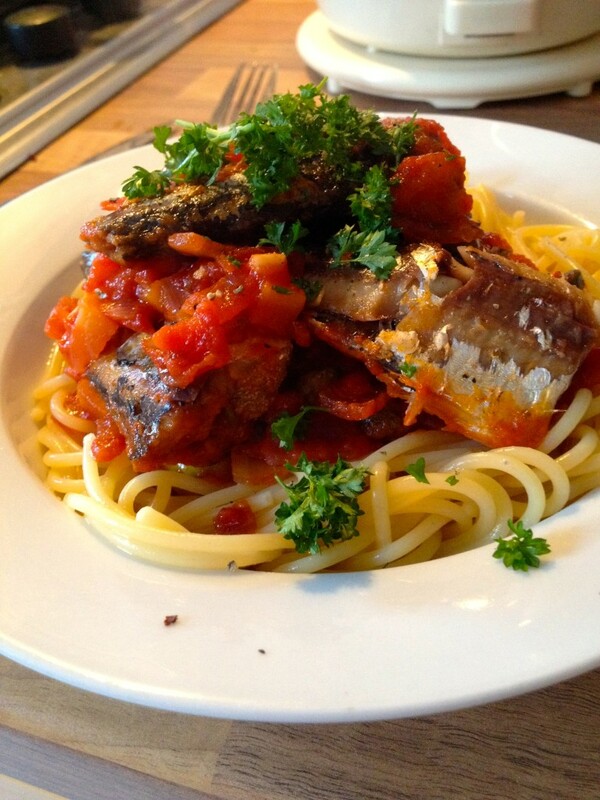 Posted in Good foods, Recipes and tagged dinner, oily fish, omega 3, pasta.